Ten years have gone by since Jenny Lewis released her solo debut, Rabbit Fur Coat. A departure from her well-known indie rock roots, the album opened up her creativity to encompass gospel, folk, bluegrass and classic singer/songwriter fare. I was fortunate to see the tour that year at Irving Plaza in New York City, where Lewis, M. Ward, and the Watson Twins created a lasting memory of guitar strums, serenades, chiffon, and candles. Fast forward to now, where fans are able to see the ensemble in a souped up version of the original. 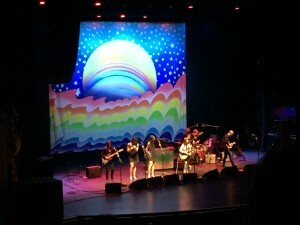 I had a chance to catch them on their stint in New York at the Beacon Theatre this past Thursday. This three part show certainly covered the price of admission. 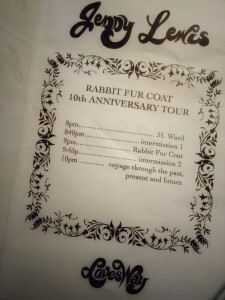 Starting with M.Ward as opener, it flowed through Intermission 1, continuing with a portal to 2006, where fans from then and now experienced an ode to the Rabbit Fur Coat tour that stood pretty true to the original. After hearing the complete album, the audience was left guessing if the show was over or not. Solving the conundrum was a roadie who passed by the stage with a sign for “Intermission.” Here we voyaged back to present day, where Lewis and her friends covered 70s inspired songs from her more recent works. Talent abounded in the intimate venue with Lewis’ ever sweet and strong vocals, The Watson Twins’ solid back-up (and dance moves), and a cast of band members who know their way around drums, guitar, and piano. Catch them if you can, the tour concludes tonight in Nashville, TN at the Ryman Auditorium. Tickets available for purchase here. 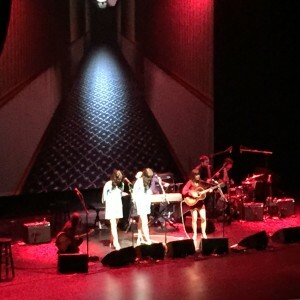 This entry was posted in music and tagged beacon theatre, concerts, jenny lewis, m. ward, new york city, the watson twins.